You are here: Home / Middle East / Egypt / Back To Sudan — almost. The Massive Temple of Abu Simbel. Back To Sudan — almost. The Massive Temple of Abu Simbel. Egypt is the land of Pharaohs. Home to some of the oldest and most well preserved archaeological sites in the world. And it’s no wonder. 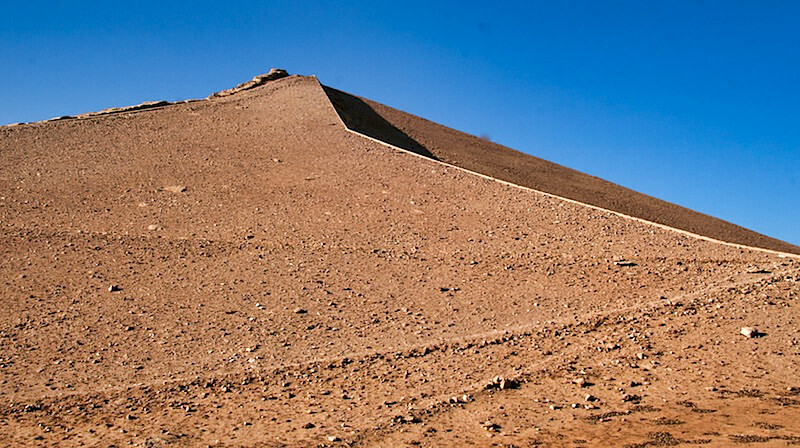 Wit the massive Sahara desert to the west and the Red Sea to the east, Mediterranean to the north, it was very in accessible in ancient times. So while the shifting sands of the deserts and the Nile River Valley helped hide these amazing sites, visitors to Egypt today have an opportunity to drift and let their minds wander and wonder of the times of Pharaohs, kings, queens and societies so old, yet so advanced. Considered one of the greatest and most celebrated Pharaohs of Egypt, Ramses II (also known as Ramses The Great and as Ozymandias in the Greek sources, was the third Egyptian pharaoh of the Nineteenth dynasty. Egyptian history often refers to him as the “Great Ancestor,” and believed to be the Pharaoh of the Exodus. Of course, all of this is a tall order for such a Pharaoh. But traipsing through Egypt and feasting eyes on this Pharaohs contributions it’s hard not to think of Ramses as a bit of an egomaniac. But we’ll get to that later. About 300km south of Aswan and very close to the Sudanese border are perhaps the grandest temples in all of Egypt — Abu Simbel. Originally hewn out of a side of a mountain near the banks of the Nile sometime in the 13th century BC, they were built by Ramses II as monuments to himself and his wife the Queen Nefereti. 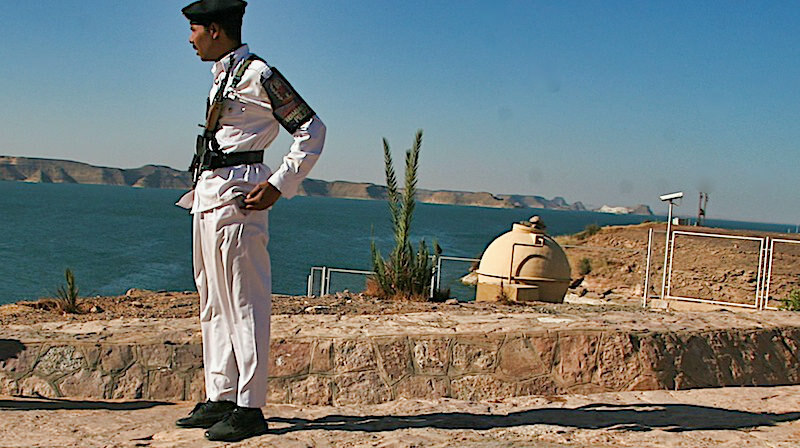 But the same effort that helped move the Philae (Isis) Temple near Aswan coordinate efforts to move this grand monument to the shores of what is now Lake Nassar. 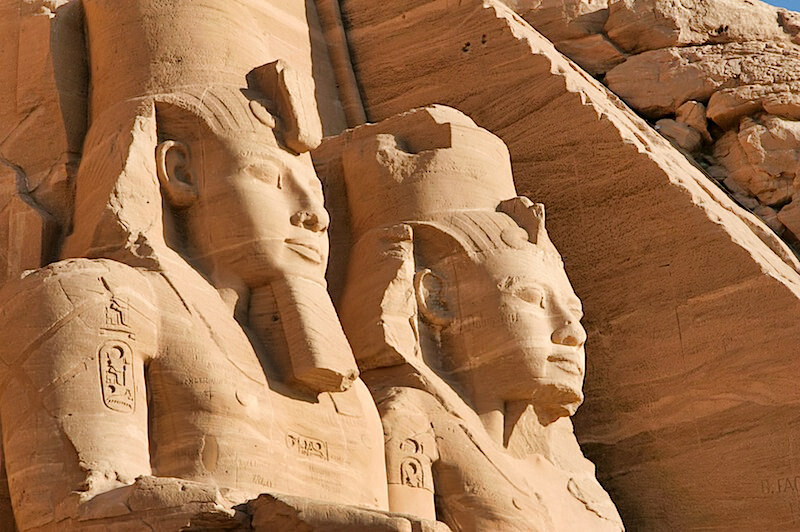 A UNESCO World Heritage Site, moving Abu Simbel was no simple task. It had to be carved out of the mountain into more than 1,000 pieces, many about 200 feet long and weighing around 30 tons. Had they not been moved, these temples would have been lost forever under neath the waters of Lake Nassar. Getting to these temples near the Sudan border is another exercise in patience and understanding of the bureaucracy of Egypt. In some ways Egypt wants to protect their image of being tourist-friendly. At the same time, I think they want you to believe that there are parts of Egypt that might not be considered safe. For example, the only way to get to Abu Simbel is to do so in a convoy which is led and followed by police and military vehicles. And depending on the week or who you ask, private cars, normal taxis and motorcycles are prohibited from riding to Abu Simbel and into the Nubian desert. This is why there is no land border accessible by foreigners between Sudan and Egypt. Everyone has to take the ferry. 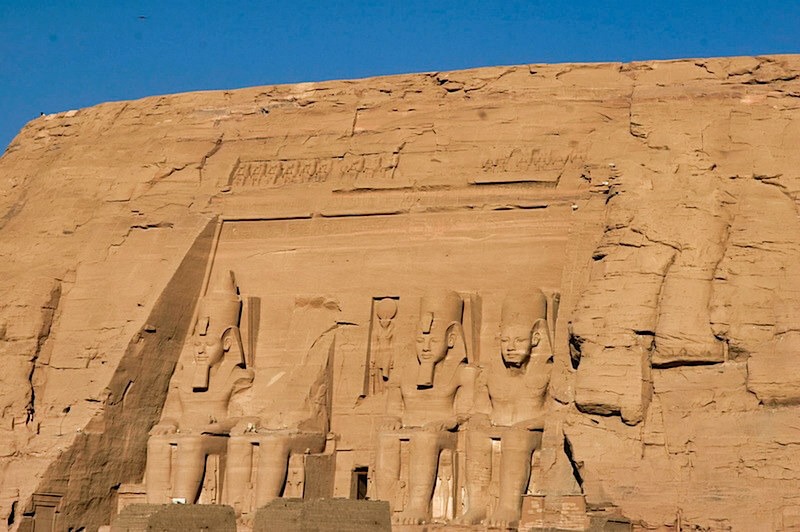 And anyone wishing to see the great Abu Simbel must go in a tourist coach, hired authorized private car or by plane — or maybe boat. 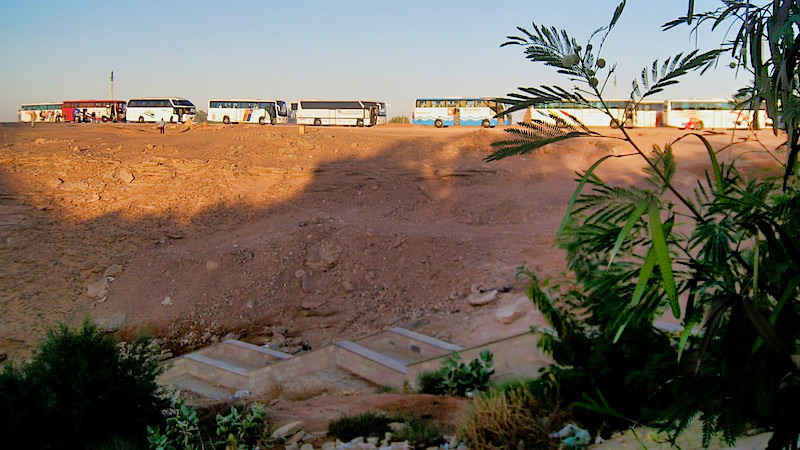 And to travel by land in bus or car you must join that convoy that leaves daily at 3:30am – to avoid the heat of the desert and to arrive at the temple just after sunrise which makes for perfect lighting to see its grandeur. Packaged tour busses and the tourists they carry make up most of the vehicles in the government mandated convoy that leaves every morning at 3:30am from Aswan to Abu Simbel. Even if they’d let me ride my motorcycle through the desert, I’m not keen on driving with a convoy or twenty or thirty busses and nor do I fancy getting up at 3:30am and being alert enough to ride a motorcycle — that is, unless I really must. So I explore all the options. Most of the luxury air-conditioned tourist busses are run by operators and loaded with tourists who’ve purchased packaged tours from travel agents in their home countries. The locals bus sounded like the train or ferry ride I had from Sudan and wasn’t air-conditioned (it’s the ride back about 10am where A/C is imperative if you’re in a crowded bus). The flights were mostly full and a bit costly given transfers to and from each airport. The private car looked like a good option. I could sleep in both directions and it would be air-conditioned. I deserved this given the train and ferry rides of days past. It cost less than the flight and yet more than the public bus. Plus, the private car would be door to door service. So I made my arrangements and wearily plopped in the back seat of a Toyota sedan at 3:00am. We jockeyed around a string of busses that stretched the length of the riverfront in Aswan. My rather aggressive driver rode the back-roads to try to get in front of the convoy. At one checkpoint he was chastised by the police but was let into the line. It took just under three hours to get to the temple where I paid my entrance fee, joined in on a guide and walked in and around. That’s when the four massive statues of a seated Ramses II, each standing 60 meters (200 feet) tall and shining gold in the morning light. Despite the increasingly building crowd I just stood there in awe. At the foot of these giant statues of Ramses stand his children. My mind drifted and I thought about the two monumental Buddhas of Bamyan that were destroyed by the Taliban in 2001, one of those was nearly as tall as Ramses but not quite as old. How could anyone destroy such relics — regardless of what they mean. They’re more than 2,000 years old. Clearly I’m impressed and thankful for the work by UNESCO and the international community in preserving and protecting Abu Simbel. The seated Ramses II each are about 200 feet tall. At his feet are some of his favorite children. 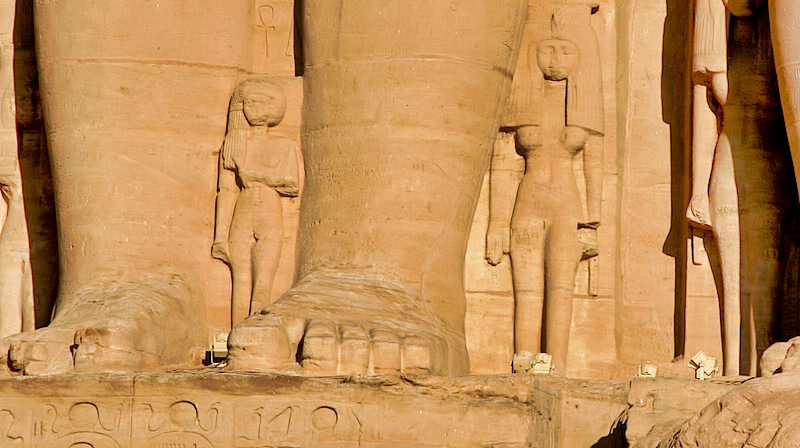 Queen Nefertari is flanked by not one statue of Ramses The Great… but two! 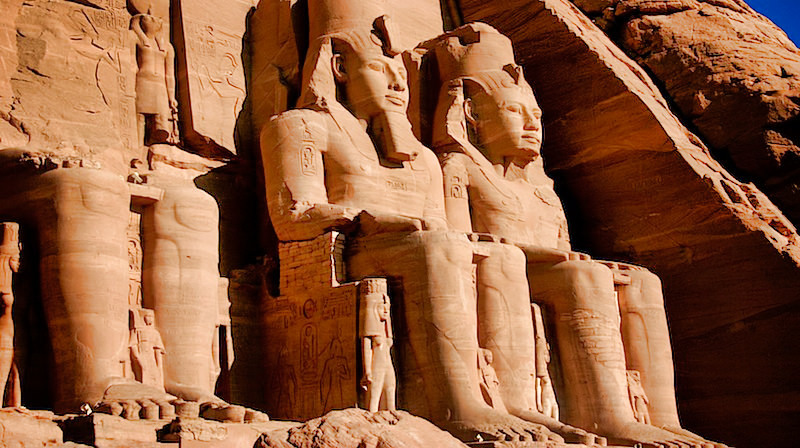 The complex at Abu Simbel is made up of two Temples. The great Temple of Ramses II and the Hathor Temple to his wife the Queen Nefertari. 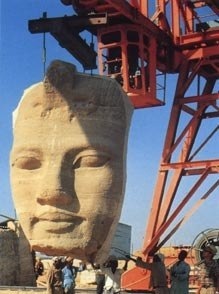 Massive heads and all were cut into pieces, moved from up river and put back together here. The mountain is actually a man-made dome. Adjacent to the The Great Temple is the of Hathor is to the north of the Great Temple. 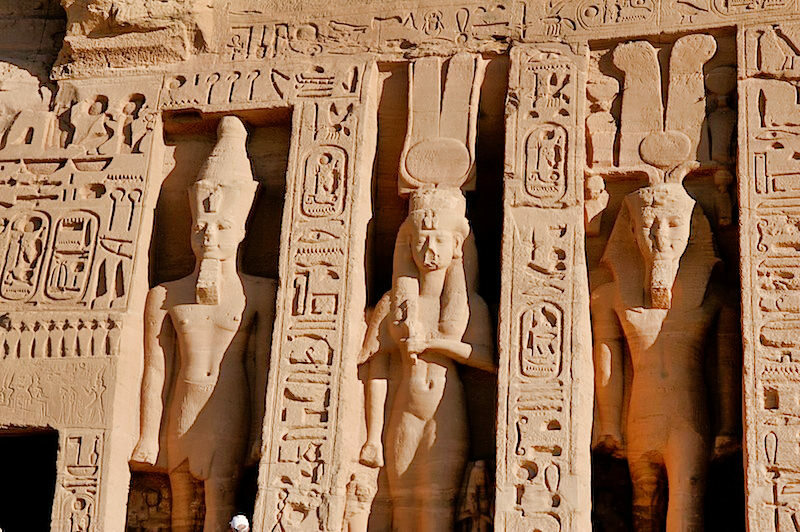 It d epicts Ramses II’s first queen, Nefertari, on the facade between statues of her husband, of course. The inside of this temple shows Nefertari participating in the divine ritual in the same capacity as her husband. The holy of holies features a statue of the goddess Hathor represented as a cow. Frankly it’s hard to imagine the building of these two temples more than 2,000 years ago. It’s hard to imagine the rituals that were performed here for hundreds of years. And it’s further difficult to comprehend that this temple was buried by sand until the early 1800’s when it was discovered. And what a discovery! Out in the middle of nowhere exists something as grand, meticulous and well preserved. Legend has it that Ramses II placed these close to the Sudan border to serve as a standing guard against the Nubians and to intimidate them. Once again my imagination wanders. 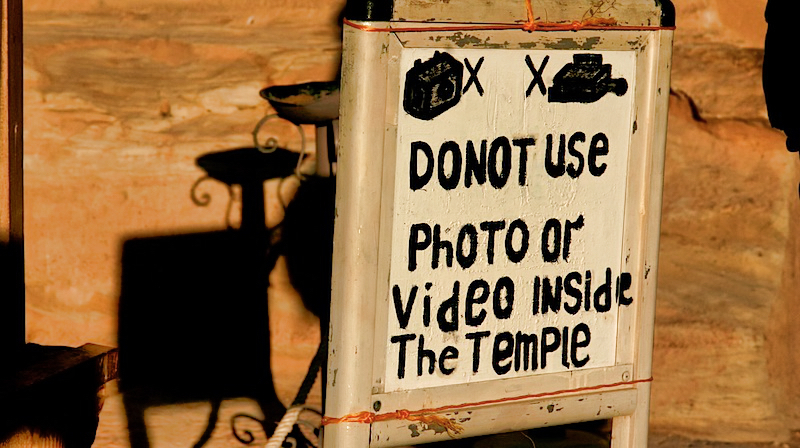 Then there’s the standing policy of no photographs inside the Temples. Okay, I understand though it’s something new. There are two reasons for this, I believe. First, is there are vendors toting postcards and remembrance books outside that have all the pictures of the interior that you’d like. Second, the security police who stop anyone attempting to take a picture. But during less busy times they buddy up to a tourist and in the guise of showing something unique ore more interesting in a corner of the temple will then let you take a picture. But they expect “baksheesh” or a tip for letting you do so. This happens usually to individuals not on tours with guides. It’s the police thinking to themselves that “hey everyone else is making money on these tourists, I want my share.” It’s never been so blatant until I got here, and it does get tiring. Notwithstanding, the Abu Simbel Temple inspires and moves tourists and yours truly more than any photograph could. After a couple hours wandering the temples I got back in the car and slept another 3 hours back to Aswan where I pulled myself together for a departure to Luxor that afternoon. The temple is the fictional field headquarters of MI6 in the 1977 James Bond film The Spy Who Loved Me, containing a M’s office, conference room, and Q laboratory. The temple is a setting of the 1978 film Agatha Christie’s Death on the Nile, where the statues “sing” because of the wind in the crevices (similar to wind blowing over a bottle). The temple is shown in 2001’s The Mummy Returns, as a way to the Ahm-Shere. The temple also features in Matthew Reilly’s Six Sacred Stones. The temple can be seen briefly in the background of the city-planet of Coruscant when Queen Amidala’s ship first arrives in Star Wars Episode One: The Phantom Menace. – above photo of relocation of Abu Simbel from UNESCO. https://i2.wp.com/www.worldrider.com/wp-content/uploads/2014/08/mvngabusmbl-tm1.jpg?fit=218%2C294 294 218 allan https://www.worldrider.com/wp-content/uploads/2014/08/worldrider_logo_white_border-trans1.png allan2008-04-28 11:12:082008-04-28 11:12:08Back To Sudan -- almost. The Massive Temple of Abu Simbel. UNESCO ROCKS!!!! (And so do you :-)…..